The Battle of the Bulge was a major German advance and Allied counter-offensive lasting from 16 December 1944 through 25 January 1945. The Germans launched an assault of 13 divisions, 8 infantry and 5 armored, with about 200,000 men and over 340 tanks and 1,600 artillery pieces. The Allied forces, with just 4 infantry divisions and 1 armored division, about 83,000 men and 242 medium tanks, were taken by surprise. Ultimately, about 610,000 American men were involved in the battle, with 19,000 of them killed and 89,000 injured. The U.S. forces in the path of the German advance suffered the highest casualty rate for any U.S. operation of the entire war. The Germans called it Unternehmen Wacht am Rhein or Operation Watch on the Rhine. To the French, it was the Bataille des Ardennes or the Battle of the Ardennes. 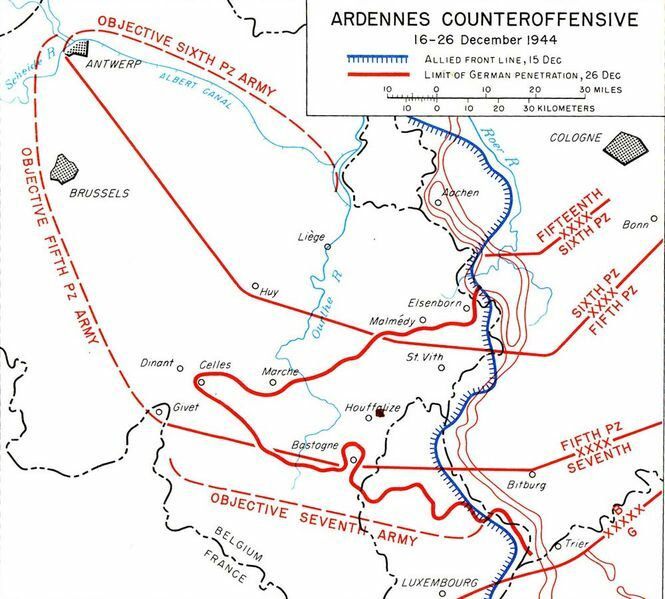 The Allied forces referred to it as the Ardennes Counteroffensive. 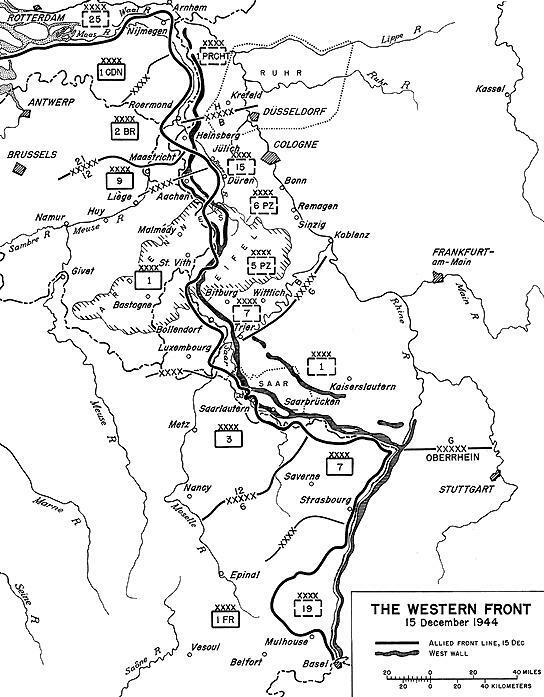 The rapid German advance led to a pronounced westward bulge in the roughly north-south line of advance of the Allies. Newspapers began referring to it as the Battle of the Bulge in the stories accompanied by maps showing that bulge, and it became the most common name for the initial advance and Allied counteradvance. The Allies had pushed east from the early June landings in Normandy, moving across France and into Belgium. By early to mid December they had advanced through Belgium past Antwerp and Brussels and were approaching the German cities of Düsseldorf and Cologne on the lower Rhine. Below is the situation as it stood on 15 December, the day before the German advance started. The German pushed to the west during the ten days 16-25 December 1944 in their Unternehmen Wacht am Rhein, or "Operation Watch on the Rhine." The "Bulge" westward in the German line and the source of the common name for the battle is obvious here. The initial German attack involved 410,000 men; 2,600 artillery pieces; just over 1,400 tanks, tank destroyers, and assault guns; 1,600 anti-tank guns; and over 1,000 combat aircraft. Reinforcements two weeks later brought the total German strength to about 450,00 troops and 1,500 tanks and assault guns. The Germans had been pushed back to their own territory, and communication was now largely based on telephone and teleprinter. Radio was used far less, cutting off that source of intelligence. There was no local intelligence network like the Résistance in France. So, the Allies were caught by surprise. The Germans began their assault at 05:30 on 16 December 1944. It began with a 90-minute barrage using 1,600 artillery pieces along a 130-kilometer front. Kampfgruppe Peiper, led by SS-Obersturmbannführer Joachim Peiper, consisted of 4,800 men and 600 armored vehicles. It was tasked with leading the main effort in the northern section. It had the latest and most powerful German heavy tank, the Panzerkampfwagen Tiger II. That tank required 3.8 litres of fuel to move 800 meters. This was going to limit how far German forces could advance. Kampfgruppe Peiper did not get moving until almost 16:00, over 16 hours late. It reached Bucholz Station on the early morning of 17 December. The Germans committed two massacres on the 17th, one near Malmedy where 84 U.S. POWs were machine-gunned, and the other at Wereth where 11 U.S. soldiers from an all-African-American unit had surrendered. They were tortured and then shot by men of the 1st SS Panzer Division. Kampfgruppe Peiper attacked Stavelot on 18 December but did not capture the town. German infantry and paratroopers attacked the American defenders of Stoumont at dawn 19 December, followed by tanks of Kampfgruppe Peiper. They captured the town after a two-hour tank battle. Small units of the U.S. 30th Infantry Division attacked the scattered units of Kampfgruppe Peiper on the morning of 21 December, with little success. They followed this with artillery shelling on 22 December. Kampfgruppe Peiper was out of food and fuel. On 23 December they abandoned their vehicles and heavy equipment, broke through American lines, and returned to the German lines. 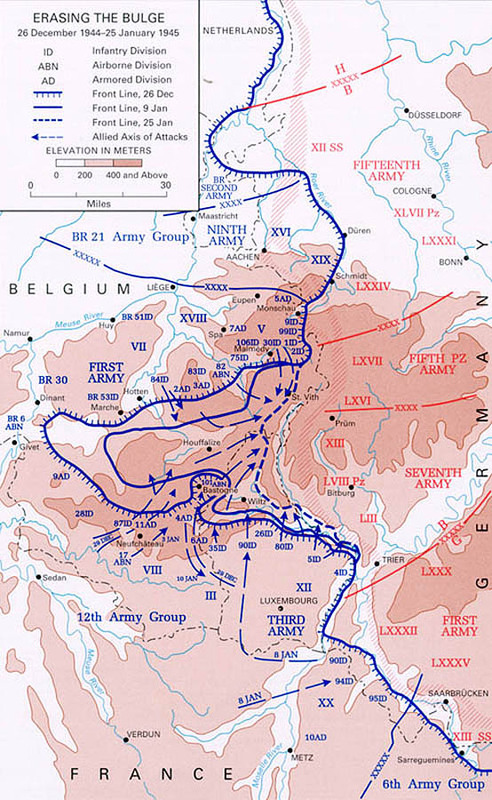 In the center, UK top commander Montgomery ordered the limited armored units still available to defend the Meuse river crossings at Givet, Dinant, and Namur on 19 December. German forces in the center advanced much more than those to the north and south. They cross the Ourthe River at Ourtheville on 21 December. They had to stop for a day because they lacked fuel. But on 23 December they continued to capture the small town of Hargimont. Montgomery ordered the evacuation of the town of Saint Vith, a crucial road junction. U.S. forces fell back to dug-in positions. However, by 23 December the Germans were advancing, U.S. defenders had to retreat west of the Salm River. On 22-23 December German forces had reached the forest around the town of Foy-Nôtre-Dame, a few kilometers southeast of Dinant. On 24 December the German forces advanced just a little further. The Panzer Lehr Division captured the town of Celles, and to their north, units of the 2nd Panzer Division could see the Meuse river near Dinant. This marked the furthest western penetration of German forces during the Ardennes Counteroffensive. Eisenhower and his commanders had realized by 17 December that the German offensive in the Ardennes was a major offensive, not a small local operation. They began sending large numbers of reinforcements, a quarter-million Allied troops were en route within a week. General Gavin of the 82nd Airborne Division arrived in Bastogne early — he tasked the 101st Airborne Division with holding Bastogne and sent the 82nd against the SS Panzer Division, and to the important battles in the northernmost area. The initial German advance in the south had been slowed. The U.S. 101st Airborne Division, reinforced by units of the 9th and 10th Armored Divisions, managed to reach Bastogne by truck in the morning of 19 December. They immediately set about defending Bastogne, causing the Panzer units to pass on either side. The Germans didn't capture Bastogne and its important road intersection, but they had cut it off. 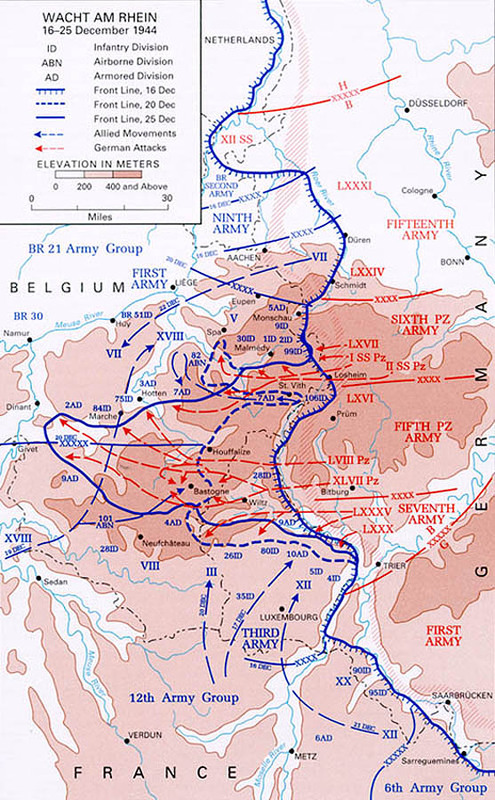 German forces had surrounded Bastogne by 21 December. Some units continued, others stayed to assault Bastogne in order to capture its crossroads. The American defenders were the 101st Airborne Division, the all-African-American 969th Artillery Batallion, and a unit of the 10th Armored Division. There wasn't much food. By 22 December ammunition stores had run low enough to limit the artillery to 10 rounds per gun per day. The weather cleared enough on 23 December to start supply airdrops of ammunition, food, medical supplies, and blankets. The airdrops continued through four of the following five days. Allied airforces also launched bombing raids on German supply depots in their rear, and ground-attack aircraft began strafing German troops attempting to advance along roads. The American defenders destroyed all the attacking German tanks by 25 December and held Bastogne. Lead units of Patton's 4th Armored Division and the 26th Infantry Division opened a corridor to Bastogne late in the afternoon on 26 December. On 26 and 27 December trapped Panzer units failed to break out, and much of their equipment was captured by the Allied. German forces launched two new operations on 1 January 1945. At 09:15 the Luftwaffe launched large attacks against Allied airfields in the Low Countries. Later that day, German army units began a major attack against the 110-kilometer line of the Seventh U.S. Army to the south of Bastogne. The German offensive ended on 25 January. This offensive, Unternehmen Nordwind or "Operation North Wind", was the last major German offensive on the Western Front. As Stephen Ambrose describes it, "The 101st Airborne still had a complaint. As the story of the Battle of the Bulge is told today, it is one of George Patton and his Third Army coming to the rescue of the encircled 101st, like the cavalry come to save the settlers in their wagon circle. No member of the 101st has ever agreed that the division needed to be rescued!"